President Abraham Lincoln considered the appointment of Farragut, as commander of the West Gulf Blockading Squadron, as the best one he made during the Civil War. 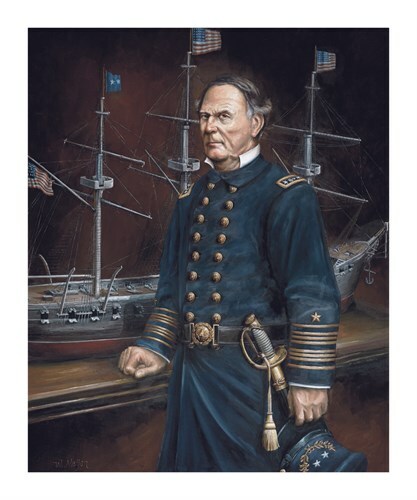 Sailing in the flagship USS Hartford on April 24 1862, he led his fleet of seventeen vessels in a successful run by the Confederate defences, engaged and defeated the enemy flotilla, and captured New Orleans. For his performance he received the Thanks of Congress citation and was made the Navy's first Rear Admiral.On August 5, 1864, as Farragut’s force of four ironclads and fourteen wooden vessels steamed down the narrow torpedo-lined channel, the ironclad Tecumseh struck a mine and sank. Shouting, “damn the torpedoes” Farragut, in his flagship, forged ahead of the hesitant fleet and soon all of his remaining ships safely passed the enemy forts. The Confederate flotilla was dispersed and by the month’s end the harbour defences had surrendered. This, the major victory of Farragut’s naval career, earned him the rank of Vice Admiral. Two years later, in declining health, he was commissioned Admiral.Meijer depicts Rear Admiral David Glasgow Farragut USN at the very height of his military career, shortly after the battle of Mobile Bay in 1864. Farragut is wearing his regulation naval uniform and holding his cap with the insignia which identifies him as a Rear Admiral. He stands in front of a model of USS Hartford, as it appeared during the battle of Mobile Bay.